Any woodworking shop is going to have its share of sander tools. Of these numerous tools, the random orbital sander happens to be one of the most important. This electric hand sander is great for getting a smooth, scratch-free finish without having to do the hard work by hand. You can also use it for a variety of easy and affordable home improvement projects. If you are looking for the best orbital sander, you should check out the 3.3 Amp 5” Vibrafree Random Orbital Sander. With the vibration cancelling technology, this sander tool is very easy to handle. It also has variable speeds for working on different materials and the cyclonic dust collection system efficiently collects and removes dust from the work surface. While having an orbit palm sander will make it easier to get good results, it is a tool that packs some power. That means that you not only want to follow all of the rules for random orbit sander safety, but you also need to use the right techniques for operating the sander tool. If you do not know how to use an orbital sander, you could end up causing damage to your workpiece rather than getting the nice, even finish you desire. When learning how to use an orbital sander, you’ll want to choose a model with dust removal, apply careful pressure and sand the edges of your piece, take your time, work on a stable surface, avoid angling the sander tool, and understand the difference between sanding discs. Many people who are new to using a random orbital sander make the mistake of thinking they can get the work done faster by pressing down on the machine. The truth is that you want to use very little pressure with your sander tool, if any at all. These machines are designed to work with just the weight of the machine and the slight pressure that comes from your hand holding it. When you press down, you are more likely to damage the surface of the piece. You could even damage your electric hand sander by using excess pressure. You need to take your time when moving an orbit palm sander down the surface. If you move the machine too quickly, the random orbit of the sanding pad can’t do what it was designed to do. To get the most out of your sander tool, you want to guide it slowly – maybe about an inch at a time – as you move the tool with the direction of the grain. If you want to get good results from your random orbital sander, you need to work on a stable surface. Before you start sanding, set up a work support. Along with that, you might want to consider clamping your workpiece to secure it in place. 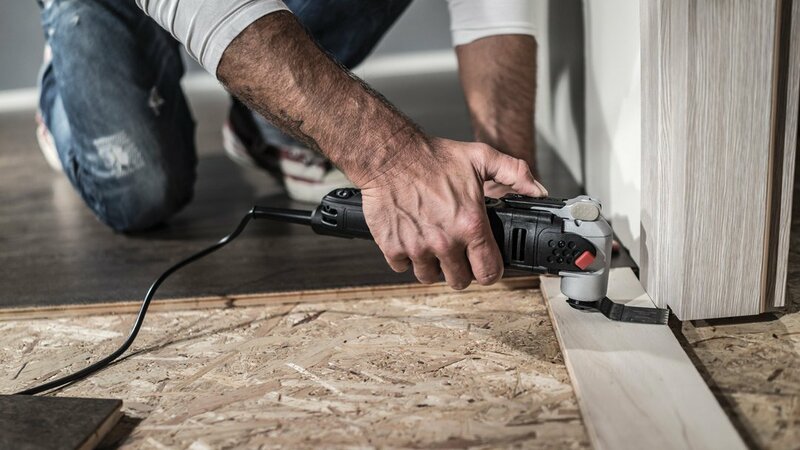 Clamps can hold the piece steady as you work, and they will prevent the possibility of it kicking or moving as you use your electric hand sander. 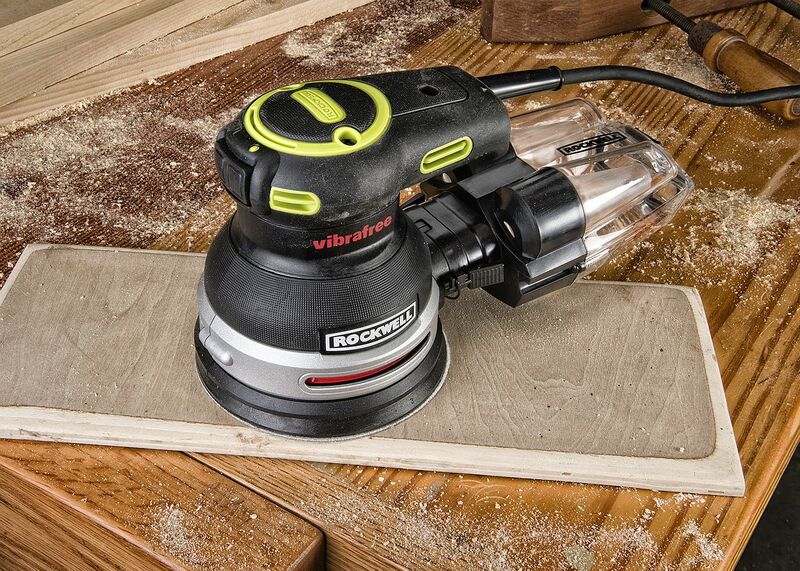 The dust collection system on your random orbital sander is good for more than just keeping your work area clean. When dust builds up between the pad and the surface, it can reduce the efficiency of the sander and make it harder to get the surface smooth. That is why the Rockwell orbital sander comes with its cyclonic dust removal system. The cyclone design effectively separates dust from air and channels it into the collection box. This design removes more dust than standard cloth collection bags, meaning that you get better results. With this electric sander, you also won’t have to stop as often to brush excess dust off the surface. Many beginners that are learning how to use an orbital sander are hesitant to let their sander tool get near the edges of the workpiece. This results in the edges and corners not having as good of a finish as the center. Even if you are new to learning how to use an orbital sander, you should not avoid sanding near the edges. All you need to do when working near the edges of a workpiece is be careful. Make sure to hold the sander securely and don’t let the sanding pad go too far off the edge of the piece. In general, you want to stop the pad from going any further than a quarter of the way off the edge of the surface you are sanding. You should only ever work with your orbital sander tool flat on the surface. If you see any high spots or marks that need to be worked on, don’t try to angle the machine to catch the area with the edge of the pad. When you see these small areas that need to be addressed, pick up a sanding block and do the work by hand. The electric hand sander is designed to do much of the work, but the abrasive discs determine how the material is going to be removed from the surface. When you start working with a random orbital sander, you need to learn about the different sandpaper grits and what they are used for. Selecting the wrong disc can have significant consequences, so you want to take the time to learn the difference between a 40 grit disc and a 100 grit disc, and when to use each grit. When it comes to how to use an orbital sander, the process is easier than you may think. All you need to do is pay attention to your work and ensure you understand how to care for your random orbital sander, and sanding will be a breeze. Find the best electric hand sander at Rockwell! Why Installing Crown Molding Should Be Your Next DIY Project What is a Random Orbital Palm Sander and How Can I Use It?